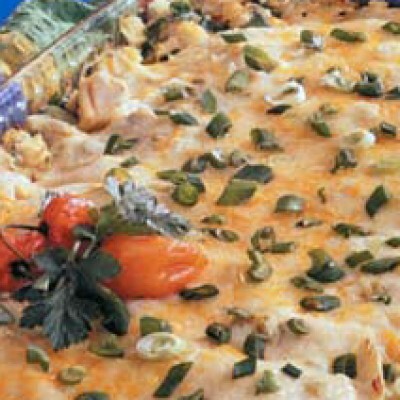 In a mixing bowl, combine cream cheese, onions, 11/2 cups Mexican-cheese blend, garlic, 1⁄4 teaspoon cumin and cilantro. Stir in chicken; set aside. In a saucepan, melt butter. Stir in flour until smooth; gradually add broth. Bring to a boil; cook and stir for 2 minutes or until thickened. Remove from the heat. Stir in Monterey Jack cheese, sour cream, chilies, thyme, salt, pepper and remaining cumin. 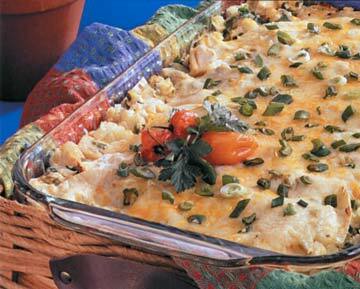 Spread 1/2 cup of the cheese sauce in a greased 13-by-9-by-2 inch baking dish. Top with six tortilla halves, a third of the chicken mixture and a fourth of the cheese sauce. Repeat tortilla, chicken and cheese sauce layers twice. Top with remaining tortillas, cheese sauce and Mexican cheese. Cover and bake at 350 degrees for 30 minutes. Uncover; bake 10 minutes longer or until heated through. Let stand 5 minutes before cutting.